We concentrate in our best ideas. To us, the appeal of an investment is driven by the long-term fundamentals of the company and its opportunity set, rather than short-term trading factors. We believe that this long-term mindset is increasingly valuable in today’s short-term oriented market. Most investors have a bias toward action, though oftentimes the correct choice is to stay the course. We have believed in the virtues of low turnover for more than 30 years. And while a decision to stay the course isn’t always an easy one, we believe persistence helps performance more often than it hurts. We look for companies with a sustainable competitive advantage and favor the durability of its business over its recent or near-term growth rate. We believe that outperforming the market requires concentrating in our best ideas, which means we limit the number of stocks in our portfolios. Why dilute a portfolio by owning 100 stocks, when we believe our top 25 – 40 will perform better? Just because a sector is represented in an index doesn’t necessarily mean it’s a good investment. What we don’t own is just as important as what we do own. Managers often avoid concentrating their portfolios because they don’t want their returns to deviate too much from the benchmark. But academic research shows successful long-term investors tend to have concentrated portfolios. Buy when others sell. Sell when others buy. In order to outperform peers, it is imperative to invest differently from one’s peers, which is logical but easily forgotten. We believe being a good investor often requires not doing what the rest of the market is doing. We value independent thinking and are not afraid to go against the crowd when it makes sense to do so. We are wary of stories with great promise. Their stock prices are often bid up, eroding their risk-reward. We prefer good businesses trading at reasonable prices. There are times when the market presents significant investment opportunities, which are only obvious in hindsight. Those opportunities bear fruit only if the manager has the experience and skill to recognize them - and the fortitude to act. We take a top-down investment approach in identifying economic sectors with attractive risk-reward potential. 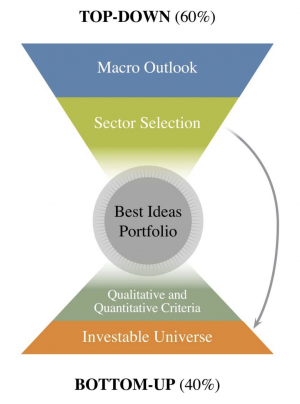 The we apply bottom-up analysis to our process using empirically based criteria to achieve a best-ideas portfolio. Our process is approximately 60% top-down and 40% bottom-up. Our top-down analysis leads us to the most attractive sectors. We evaluate each, considering relative valuation, stage in the economic cycle and capacity within the sector. Our macroeconomic analysis includes consideration of inflation, wage pressures, leading economic indicators and global short-term rates. We also evaluate market sentiment indicators such as investor surveys, valuation spreads, stock correlations and fund flows. The bottom-up process applies empirically based qualitative and quantitative criteria to identify the buy candidate. A typical Oak holding has attractive valuation, high free cash flow yield, high earnings quality and a sustainable competitive advantage. We are committed to being better investors today than we were yesterday. A key to good investing is not making the same mistakes over and over. We remain humble, continuously focused on improving our craft, and thankful for the opportunity to manage your money. Oak Associates employees and their families maintain significant investments in the same stocks held in clients' portfolios; our interests are aligned with those of our clients. Our firm culture supports doing what’s best for investors: In an industry where portfolio managers may be pressured to achieve short-term results, Oak portfolio managers have the latitude to make decisions which maximize long-term returns. Superior long-term results inevitably come from patient, disciplined, and at times, unpopular, decisions.